Gavin Lux began the day with four hits in his first three games of the season. He ended it having doubled that mark with an impressive matinee performance. MLB.com's No. 69 prospect went 4-for-4 and reached base five times in Double-A Tulsa's 10-1 victory over Springfield at ONEOK Field. Lux scored four runs, drove in three and finished a double shy of the cycle while smacking a homer and a triple in the same game for the first time in his four-year Minor League career. He also extended his season-opening hitting streak to four games. 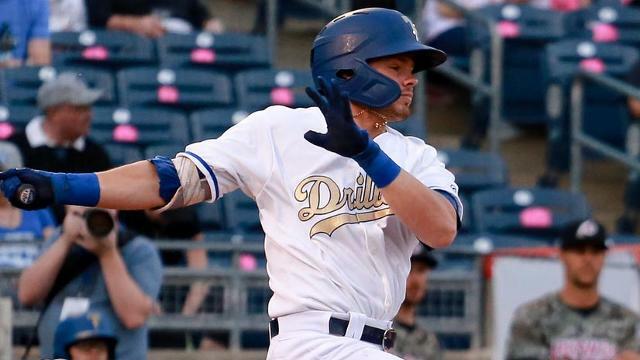 The Drillers' leadoff man made opposing starter Austin Warner work from the start, running the count full before fouling a pitch off and finally drawing a walk on the eighth pitch of the at-bat. Two pitches later, Dodgers No. 20 prospect Omar Estevez followed with a double to center field to score Lux with the game's first run. Lux singled to left on a 2-1 pitch in the second inning to move Josh Thole to third base, but he was stranded when Estevez flew out to right. Los Angeles' fourth-ranked prospect singled again off the left-hander in the fourth, this time lining the first pitch into center. Lux scored his second run of the game on 27th-ranked prospect Cristian Santana's double to left. The two hits against a southpaw represent a step in the right direction for the left-handed hitter, who hit .226/.278/.298 in 90 plate appearances against left-handers last season for Tulsa and Class A Advanced Rancho Cucamonga. In contrast, he batted .346/.424/.562 in 436 plate appearances against right-handers in 2018. His 2017 splits at Class A Great Lakes were similar, with Lux hitting .165/.250/.217 against left-handers and .273/.361/.414 against righties. The Cardinals pulled Warner after he allowed five runs on nine hits and two walks over four innings, and Lux took advantage of the opportunity to face a right-hander in the sixth by cranking a solo homer into the bullpen in right-center on the first pitch he saw from Casey Meisner. Lux's fourth hit was a two-RBI triple to center in the eighth that extended the Drillers' lead to 9-1, and he scored Tulsa's 10th and final run on the next pitch when Estevez hit a sacrifice fly to center. "The wind was blowing out, a little cross wind," Lux said, "With the starter today, he was more of a fastball-curveball lefty who commanded both sides of the plate. So for me, I was sitting on fastballs out over the plate and something I can shoot the other way or up the middle, and then if he threw a breaking ball I could pull it. Then the relievers, I was sitting breaking ball on both of them and got it twice." Monday's performance marked the third four-hit game of Lux's career -- he had one each of the past two seasons. It was also the first time he scored four runs or totaled at least eight total bases in a game as a pro. Lux broke out in a big way last season, hitting .324/.396/.520 in the California League and ranking in the top three in average, on-base percentage, slugging percentage and OPS. He continued to rake after his promotion to Tulsa and put together an eerily similar .324/.408/.495 batting line in 28 games for the Drillers. His cumulative .913 OPS was over 200 points higher than his .693 mark with the Loons in 2017, and Lux credits that improvement to a simple change in approach. "In 2017, I was so consumed with mechanics and what I was doing that I was up there trying to hit a 95-mph fastball while thinking about where my hands and legs are supposed to be," Lux said. "Going into 2018 [with] the swing adjustments I made with our hitting guys, I just pretty much told myself we're not going to toy or play too much with mechanics and focus on hitting, and whatever happens, happens ... now I feel comfortable enough where I don't have to think about it." First baseman Zach Reks was the only other Tulsa batter to notch multiple hits, going 2-for-4 with a homer and two runs scored. Estevez and Thole drove in two runs apiece, and Estevez extended his hitting streak to five games to start the year. Left fielder Cody Thomas chipped in two runs and an RBI. Southpaw Austin Hamilton opened his first season as a full-time starter with four scoreless innings, allowing three hits and a walk while striking out two on 47 pitches. Andre Scrubb (1-0) earned the win with two scoreless innings of relief, yielding one hit and a walk while striking out two.